We had 31 novice swimmers attend our first Jr. Circuit meet! What a turn out! We had many first time racers…Kiersten, Noam, Chase, Calvin, Cale, Rune, Gabriella, Cody and Andrian who all swam AMAZING! So impressed. Our experienced novice swimmers, all crushed multiple previous best times, and for some it was by 10 or more seconds. Unreal! Andrew – Silver in 100 FR, Silver in 50 BR and a PB, Gold in 50 BR and a PB and silver in 50 Fly with a PB! Sydney S. – PB in 100 FR, PB in 50 BR, PB in 50 BK! Natalie – Silver in 100 FR with a PB, PB in 50 BK and silver in 50 Fly with a PB! Anjah – Bronze in 100 FR, Gold in 50 BR and Gold in 50 BK! Chloe – PB in 100 FR, silver in 50 BR with a PB, PB in 50 BK, and bronze in 50 Fly and a PB. Bryn – Silver in 50 BR and a PB, and Silver in 50 Fly with a PB. Zephan – Bronze in 100 FR with a PB, Bronze in 50 BR, Bronze in 50 BK, and Silver in 50 Fly. Keira – PB in all 4 events! Jordan – PB in all 4 events! Will – PB in 50 BR, and 50 BK! Sydney M. – PB in 100 FR, 50 BR and 50 BK! Ian – Gold in 100 FR, Bronze in 50 BR, Silver in 50 BK, and Gold in 50 Fly. With all PB’s! 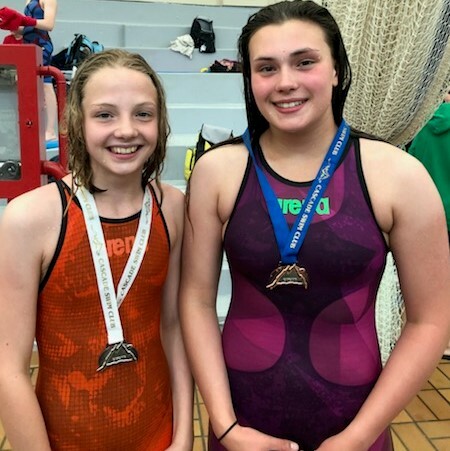 Skye – Silver in 50 BR and Gold in 50 Fly. Ani – Bronze in 25 FR, and all events were PB’s! Lane – Silver in 25 BR, Gold in 25 BK, and Gold in 25 FR. All PB’s! Rune – First meet! Gold in 25 BK, and Silver in 25 FR. Gabriella – First meet! Awesome swims! Alexis – Bronze in 25 BK, and Gold in 25 FR! Keith – Gold in 25 BR, Gold in 25 BK, Silver in 25 FR and 3 PB’s! Kiersten – Silver in 25 BK, Bronze in 25 FR! Ruby – Silver in 25 BK, and 3 PB’s! Andrian – Silver in 25 BR, Gold in 25 BK, Gold in 50 FR and gold in 25 FR. What a first meet! Miles – Bronze in 25 FR and 2 PB’s! Cale – Gold in 25 BK and Gold in 25 FR and 2 PB’s! Noam – First meet! Awesome swimming! 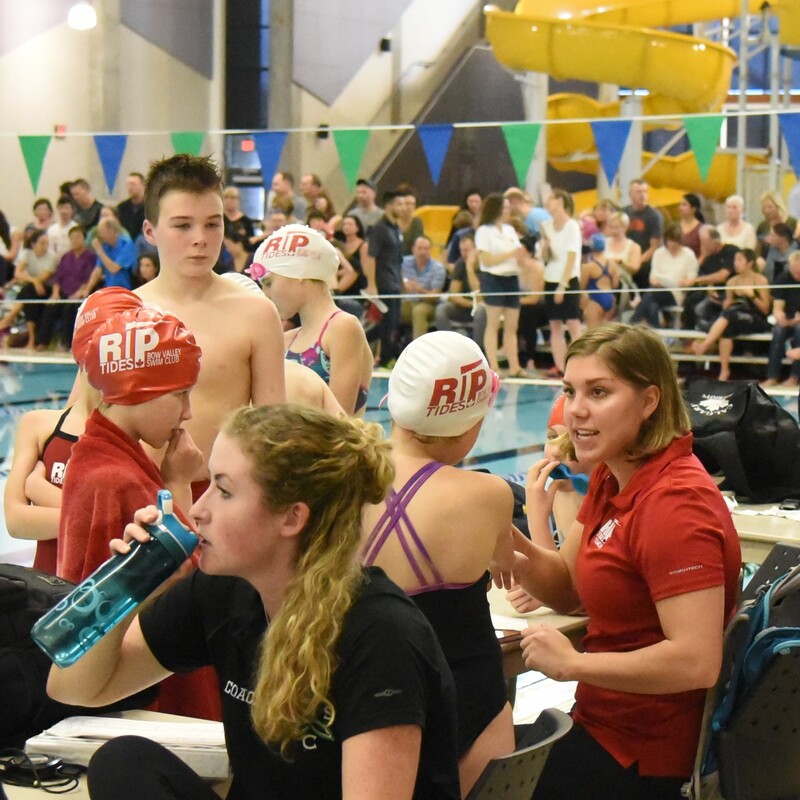 The Riptides were split up between 3 different meets over the weekend – CSI and T-Rex long course meets in Calgary and a short course meet at the outdoor pool in Radium. Ian – 2nd in 25 and 100 free and 3rd in 50 free, 50 back and 50 breast. Bryn, Isabelle, Emma, Sydney and Madeline – first long course meet, all PBs! Cascade Swimming International was a final tune up for swimmers that have already qualified for Provincials and are not attending Age Group Trials next weekend. The big four day meet featured some of the top age group swimmers in the province and some of the fastest swimmers from Saskatchewan. Emiko rose to the high level of competition by winning 6 medals, smashing 6 club records and achieving her 4th national qualifying time in the 800 free. She won gold in 100 and 200 free, silver in 50 free and 800 free, and bronze in 100 fly and 400 free. Neo broke 3 club records and his best finishes were 5th in 400 IM, 8th in 50 fly and 9th in 50 back. 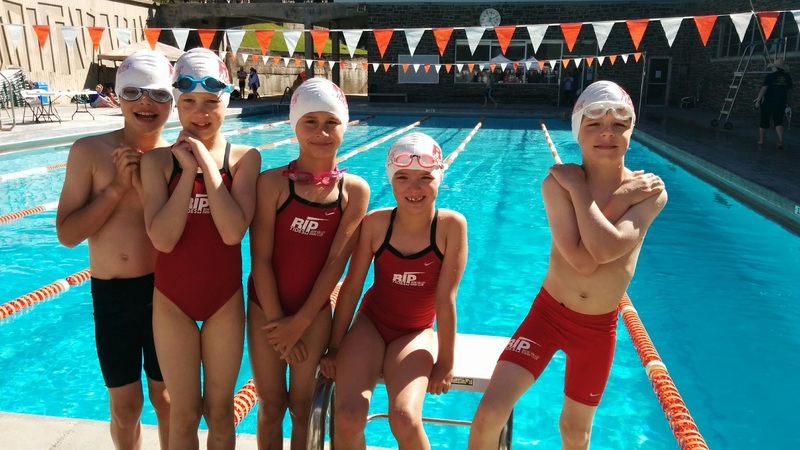 Alex, Avi, Cassidy, Emiko, Marin, Neo, Riley and Sean represented the Riptides at the short course Alberta Age Group Championships in Calgary and came away with a third place finish among small clubs. Emiko led the club with 3 podium finishes: silver in 200 free and bronze in 100 and 400 free. She narrowly missed getting two more medals with two fourth place finishes in 100 fly and the 800 free. She achieved 3 national time standards at the meet which qualifies her for the Canadian Age Group Championships in Quebec City in July. She also broke club records in 6 of the 7 events in which she swam and combined with Marin, Cassidy and Avi to break the 200 free relay club record. The girls also narrowly missed the 200 medley relay club record by three tenths of a second. At her first Provincials, Marin dropped time in every event despite swimming at Age Group Trials the previous weekend. In her first time swimming the 200 fly she finished 8th and was the 3rd fastest 11 year old. She finished the weekend with three new A times in all of the butterfly events. Neo set new club records in the 200 fly, 200 back, 400 IM and 800 free and swam three new personal bests with 5 second drops in his 200 back and 200 IM and a huge 19 second drop in his 400 IM. He also got his first 16-17 year old A time in the 200 back which qualifies him for the Speedo Alberta Open series. Alex made A finals in the 50 and 100 fly and 50 free. His performance along with Emiko’s helped them get selected for the North vs South camp to train with and compete against the top 11-13 year old swimmers in the province. On October 26 the Riptides hosted the 3rd annual Subway Rockies Invitational, the first for the club in Canmore’s new 8 lane pool at Elevation Place. 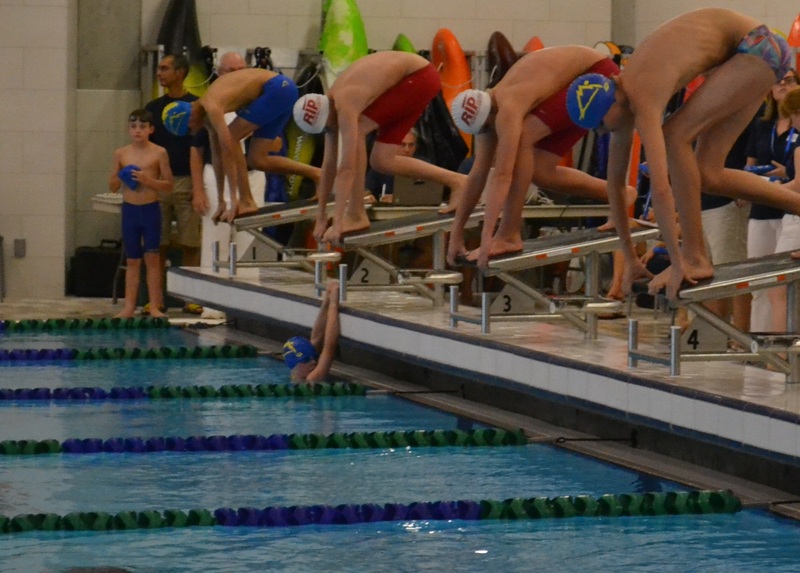 Thirty Riptides raced against 140 swimmers from the Cochrane Comets, Cranbrook Tritons, Columbia Valley Otters, Glencoe Gators and Calgary’s Cascade Swim Club. Although it was only the first meet of the season, many swimmers still achieved personal bests and broke club records. The team of Avery, Maja, Emiko and newcomer Rachel Olsen smashed the club record in the Girls 11&12 200 freestyle relay with a time of 2:15.65, sixteen seconds faster than the old record just set last spring. Emily set a new record in the Girls 10&U 25 butterfly, swimming 19.53 and earning first place in the event. She also finished first in the 25 free. Domenic took a second off the club record in the Boys 10&U 25 back, winning first place in the event. He also finished first in the 25 free and came within a tenth of a second of the record. Domenic added a 2nd and two 3rd place finishes at the meet. Alex won the top Age Group Aggregate medal for the 12 year old boys with two 1st and one each of 2nd, 3rd and 4th place finishes. New Riptide, Riley Toohey, came over from the Coho summer club and had a great first meet with two 1st, one 2nd, and one 3rd place finish. He also went sub 30 in the anchor leg of the boys 200 free relay helping the team of Neo, Nick and Sean to a 2nd place finish. Other top swimmers were Avi and Neo with two 1st and three 2nd place finishes each. Thanks for the support from Subway Canmore and the tasty sandwiches and cookies that were provided for the officials and coaches!